On Thursday (today) June 12, 1986 – at Oxford, the Combined Universities Captain David Throne was rather hospitable. He put the visiting Indians in on a warm and sunny day. Raman Lamba and my favourite Krishnamachari Srikkanth had a 180 run opening partnership off just 33 overs. 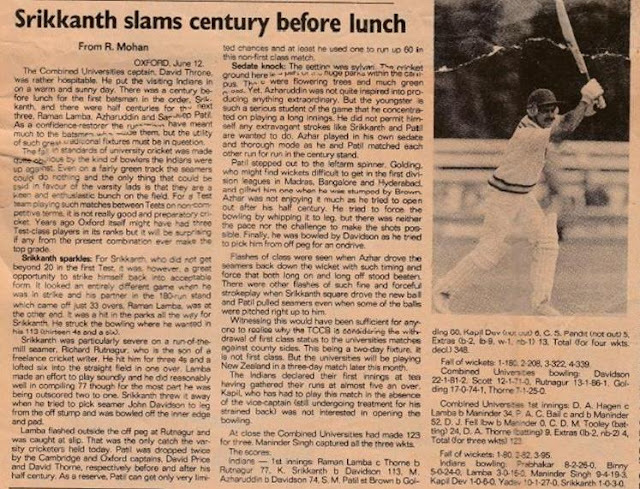 Krish Srikkanth scored a century before lunch !! ~ I was very happy .. .. ..
Rashid Khan and other Afghans made hay during IPL. Cricket in Afghanistan has been on the rise for years now. From budding cricketers first learning the sport in the refugee camps along the Pakistan-Afghanistan border to a professional team making an appearance in the ICC World T20, cricket has come a long way in the war-torn nation. Gaining Test status along with Ireland, and confirming their maiden Test fixture against India at Bengaluru today is a defining chapter in the fairytale that the Afghan national cricket team has charted. Afghans have been groomed by and in India. Of the many associated with their cricket, Dean Jones who acted as coach after the stepping down of Lalchand Rajput, a position he held till the full-time appointment of Trinidadian Phil Simmons. For the historic clash at the M Chinnaswamy, Dean Jones believes that the team is better-equipped for their Test debut than teams such as Sri Lanka, Bangladesh and even New Zealand ! They are a better team than those teams back then, he said. Lankans have played very many times at Chepauk (against Tamil Nadu in Gopalan trophy) ~ and thus the only Test against India in Sept 1982 was not all that new – though it was their test status and playing a National side – Arunlal and Rakesh Shukla, the Delhi leggie made their debuts. Srilanka made 346 with Roy Dias 60 and Louis Rohan Duleep Mendis making 105. Dilip Doshi took 5 wickets. India gave a sound reply and declared at 566/6 aided by Sunny Gavaskar 155 and Sandeep Patil 114. In the 2nd Dias 97 & Mendis 105 (Kapil 5/110) saw Lanka score 394 setting a target of 175. Indians were 135/7 after 28 overs when stumps were drawn. Curiously Dilip Vengsarkar & J Arunlal opened, Sandip Patil, Kapil Devl, Yashpal Sharma, Gundappa Viswanath, S Madanlal, SMH Kirmani and Sunil Gavaskar followed in that order. Shukla and Doshi did not bat. That was to be Shukla’s only test though he did perform well in Ranji and domestic tournaments. At Bengaluru toay, on their first day in Test cricket, Afghanistan looked like they wanted to experience the full range of emotions: they conceded 52 fours and four sixes, made a DRS blunder early on, dropped a catch late in the day, enabled two very different types of centuries, and still, somehow, managed to dominate an entire session and stay alive. India, who were 280 for 1 at one stage, and striking at well more than five per over thanks to domineering efforts from their top three Test openers, lost 5 for 63 in the final session. 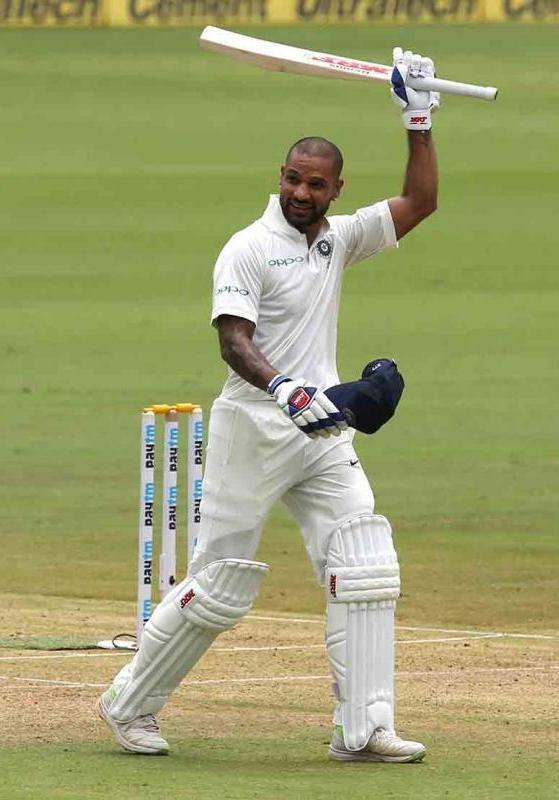 Most of the attention on Thursday was on Afghanistan who were making their debut in Test cricket, but Shikhar Dhawan demanded his own spotlight, becoming the first Indian batsman, and sixth overall, to score a century before lunch on the first day of a Test match. He joined Victor Trumper, Charles Macartney, Don Bradman, Majid Khan and David Warner in achieving this unique distinction. The first three instances took place before the Second World War, which means Dhawan is only the third player to score 100 in the first session of a Test in last 80 years. He went to lunch on 104 off 91 balls with 19 fours and 3 sixes. He ran only 10 of his runs. At stumps, Rashid Khan has figures of 26-2-120-1. The previous record for highest score by an India batsman in the first session of a Test was 99 runs by Virender Sehwag against West Indies in Gros Islet in 2006. Sehwag occupies three of the top five spots on this list, which is made complete by Farokh Engineer, who scored 94 runs before lunch, also against West Indies, in Chennai in 1966-67.